In contrast to the jargon-filled manuals that come with most digital cameras, The Beginner’s Photography Guide presents step-by-step digital slr camera basics, while introducing and demonstrating a wide variety of techniques that will inspire the novice digital photographer. Grouped together by themes — color, composition, natural light, framing, and more — each camera technique is broken down into an easy-to-follow step-by-step sequence, and features annotated photographs and suggestions on getting the best from digital slr cameras and taking eye-catching photos. My parents bought me a DSLR for Christmas 2011 and since then I’ve been devouring all the knowledge I could to teach myself how to use it and take beautiful photographs. I’ve done online courses, watched videos and read books. The most recent book I read was The Beginner’s Photography Guide and it outshines any of the previous photography books I read for a few different reasons. A big plus for me is that the book is written in PLAIN English! Paragraphs are short and to the point with the info you need to know. I was able to follow along and understand the concepts that were new to me like some of the information about focusing and how to read a histogram. I was commenting as I reading, “Oh I get it!”. Another thing I liked was the breadth of topics. There’s sections on Equipment, Exposure, Focusing, Lenses, Lighting, Flash and Image Enhancement. Within each section, you’ll find different topics covered. For example, I’m planning to buy a new lenses and was able to learn more about the types of lenses available and could decide which one would suit me the best at this time. I’d like to have every possible lens out there, but budget constraints dictate otherwise! Good lenses are not cheap! It’s also image rich…meaning lots and lots of pictures so you can see every step! If you are a visual learner like me you will find this very helpful. One thing I learned was how to properly hold my camera! Seems like a simple thing, but if no one ever showed you, how would you even know? I’m doing it right now and I can a difference in the photographs I take. If you were curious about all the little buttons and dials on your camera and what they mean, this book explains it. It talks about the different modes of shooting. I normally shoot either in Aperture Priority or Manual. There’s a discussion on Shutter Priority which I want to test to out. I read the book through once, but as I know I will have to come back to it. There’s a lot of information to digest and I learn by doing. I need to try out their tutorials and get it right on my own. This, for me, is the best way to learn. Practice, Practice, Practice! Overall, I’m very glad I had the opportunity to read The Beginner’s Photography Guide. I feel it’s helped me understand some of the concepts that were a little fuzzy to me before and it’s motivated me to get out there and try new things with my camera! 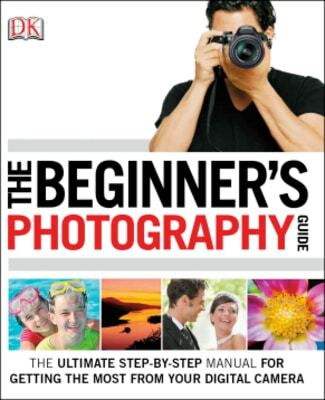 The Beginner’s Photography Guide is part of DK Canada’s Dads Rock Boutique. If that special man in your life is a budding photographer, pick him a copy as a Father’s Day gift! I’d like Do It Yourself book. I would love to own WORLDS MUST SEE PLACES. My hubby would like the SMITHSONIAN MILITARY HISTORY BOOK. http://cn.dk.com/nf/Book/BookDisplay/0,,11_9780756675530,00.html The Guitar Manual as a gift for my son. Seeing as I am a single mom, the book “Do It Yourself” would come in very handy. I would like to take a peek in the “Do it Yourself” book. It would take more than a book to help me take good pictures.